The Christmas Markets in full swing outside the new city hall, a scene which is repeated every year in downtown Munich, Germany. A tall Christmas tree with shimmering white lights stands next to the Rathaus (city hall) in the Marienplatz in downtown Munich, Germany. The Christmas markets are a scene which is repeated every year in many cities and towns throughout Europe during the Advent season which begins on the fourth Sunday before December 25th - Christmas Day. City of Muenchen (Munich), Bavaria, Germany, Europe. 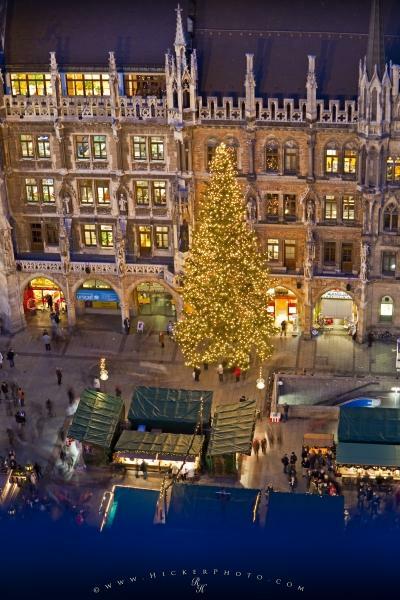 Photo of the Christmas scene during December every year in downtown Munich, Germany.